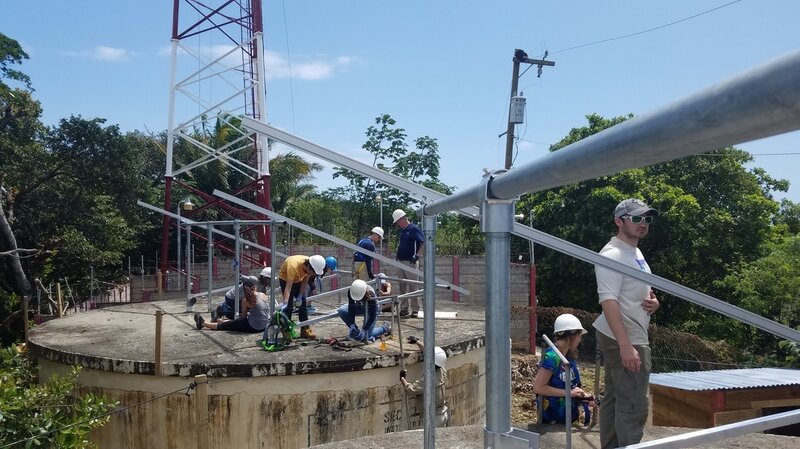 While most college students across the country spent their spring breaks in typical fashion, members of NECA’s Penn State Student Chapter were in Punta Gorda, Roatan, Honduras installing solar-powered water pumps as part of a service project. This is the seventh year the Chapter has sent a team of students to the Central American country to help local residents gain access to clean water. This year’s project is the largest to date, helping 350 families in the local community. With the installation of a photovoltaic array, consisting of nearly 40 solar panels, there will be a continuous pumping of water to the town’s water supply. Previously, the community received approximately 50kWh of electricity per day from the local power company, and service was often interrupted. The installation nearly doubled the generation, as the community now receives a steady 99 kWh of electricity per day, which is sufficient to power a water pump. As a result, the community has access to water every day rather than only three days per week. In addition to the installation, the Penn State Student Chapter met with residents, teachers, and school students to teach them about the water system and solar power. Launched in 2014, Electri International’s Student Passport Initiative Competition encourages NECA Student Chapters to complete a service learning project in developing communities in the U.S. or abroad. As part of the competition, Student Chapters submit proposals to the Electri Council on their service projects. Winning teams, judged and selected by the Council, receive cash awards to help fund those projects – $10,000 for one domestic initiative and $20,000 for one international initiative. The Penn State Student Chapter won the competition in 2014 and 2015, using the award to support their service work in Honduras. Thanks to the NECA Penn-Del-Jersey and Western PA Chapters who helped support the students with funds for equipment, room and board, and travel. And, most of all, thanks to our students for their inspiring commitment to giving back. Their dedication is a testament to the caliber of young people we work with and we are privileged to help guide them along their path in the industry. To read more about the trip, visit the Penn State Student Chapter’s blog here. The National Electrical Contractors Association student chapter at Penn State University didn’t expect to find success so quickly. With a new class of officers – most of them juniors – they thought they could continue to build up the club over the next two years and compete for Student Chapter of the Year in 2017. Then they won the award in 2016. “It was a pleasant surprise,” said President Bret Jablonski, who has been a part of the student chapter for about a year. One of the cornerstones of the student chapter’s proposal was its entry into this year’s Green Energy Challenge, which was focused on an elementary school in the community. Highlights included the design and implementation of six interactive activities for students and teachers focused on energy and sustainability as well as multiple meetings and feedback sessions with NECA contractors to gain feedback on their proposal. In April, the student chapter organized a spring break service trip to Roatan, Honduras as part of the Student Passport Initiative to install a 4kW solar array in the Juticalpa community. In addition to the successful construction of the solar system, the team found success engaging the community in the project. Interest in NECA has grown over time, and now club meetings typically draw 15-20 students. Jablonski said one of the strengths of his student chapter is its diversity. Officers try to plan a mix of events that are service-oriented, technical and fun. Familiar faces are welcome as well. Many Penn State graduates who were members of the student chapter come back to speak as working professionals in the electrical construction industry. The student chapter also has the support of two NECA Chapters, the Penn-Del-Jersey Chapter and the Western Pennsylvania Chapter, so members can gain real-world experience. “To get support from both sides of the state was pretty exciting,” Jablonski said. He also said it is important to emphasize recruiting and getting a good membership base. “It’s always good when you have committed members,” he said. ​Jablonski said it’s important to stay busy throughout the year – and they have a variety of projects lined up for 2017, including the Green Energy Challenge and another trip to Honduras. A new group of students will travel to Roatan over spring break to install solar panels to run water tanks. ​“Stay involved, even in down time – pretty much anything that helps us grow is what we strive for,” Jablonski said.